About this time last year, I was searching high and low for a round side table that was at least two feet tall to use as a nightstand. It was much harder to find than one would have imagined! Most accent tables were only 18″-20″ high, and even without a boxspring on our bed that height is awkwardly low next to the mattress. I ended up eventually getting a friend to help me make one out of copper plumbing pipes. So you can imagine my mixed emotions when I spotted not one, not two, but three adorable and appropriately sized tables at my local Target the other day. Option #1 was even adjustable, but I couldn’t find it online. It was marked down to $72 in-store. Still a little expensive, to my mind, but I like it. The other two were $80 each. The one on the left is especially dreamy. You can view them online here and here. 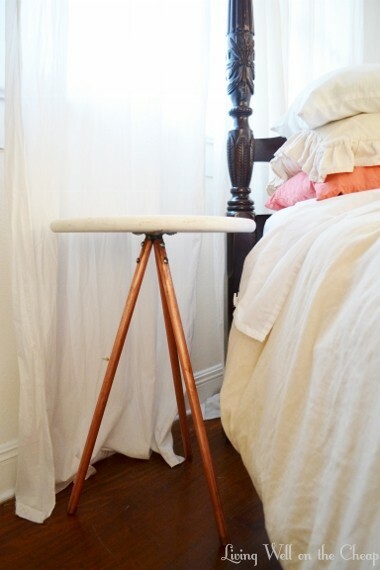 Although I wouldn’t say I’m in love with the two nightstands we have now (one is the copper and wood construction pictured above and the other is this from Ikea), my yearning for a replacement isn’t nearly deep enough to spend $70-$80 on a new one. That’s probably more than I spent on the other two tables combined. But if you’re in the market for a new nightstand or accent table these are excellent choices! Like I said, I especially like the two-tiered option. It’s made of iron, rather than aluminum, and is more traditional than trendy. Too true. They are lovely options, but I also hoard too much stuff by my bed. 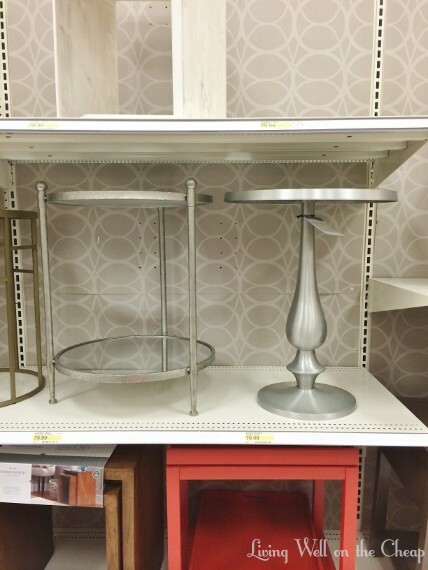 I have a tall wooden candlestick that looks similar to Target’s Threshold pewter pedestal table that Charlotte featured.above. 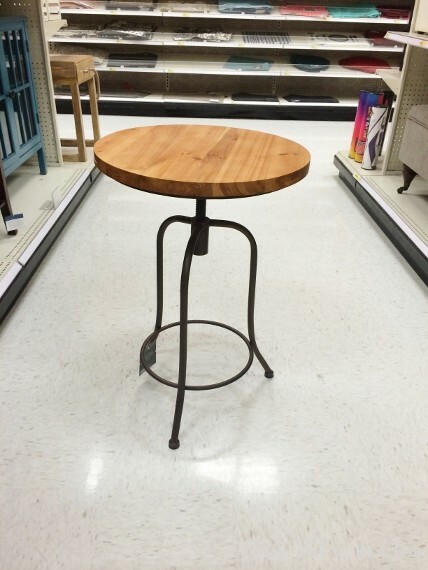 I am thinking about making it into a side table for a drink stand next to a chair (or maybe a plant stand). Note: about Target. Don’t know how the sale cycles work at this store in your part of the country, but many home decor items are discounted weekly once they move to the clearance section. If you eye something you like ( but it’s still too expensive), simply keep returning on the day of the week they reduce prices. I have bought many great deals this way. Of course, if you delay, you always risk someone else snapping up your desired item. Since I don’t like to pay full price, it is okay for me to chance it.